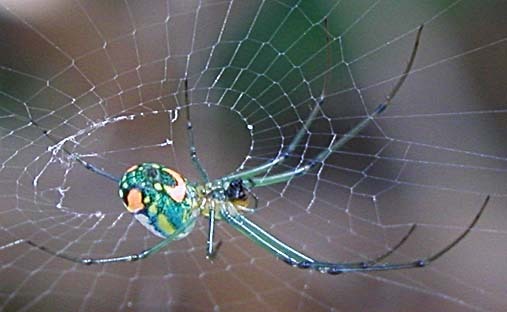 This page is dedicated to various and sundry spider pictures. 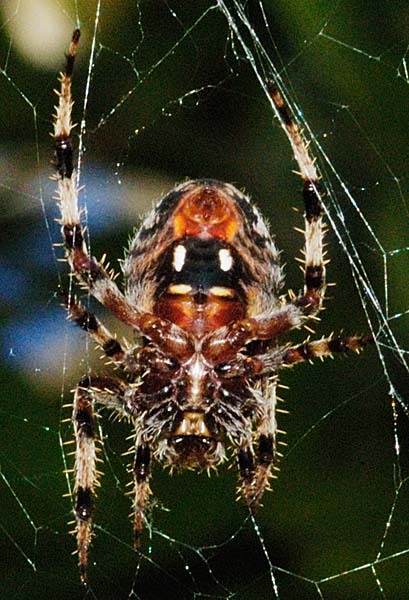 My main Spider picture page was my hit leader back in the day. Backyard Texas spiders are at this page. 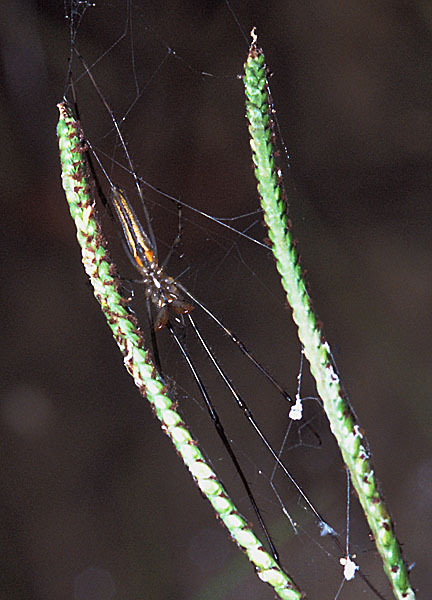 This page has some Argiope pictures and some other misc. spiders. Hope you enjoy the photos! Scroll down to see the large pictures on this page. 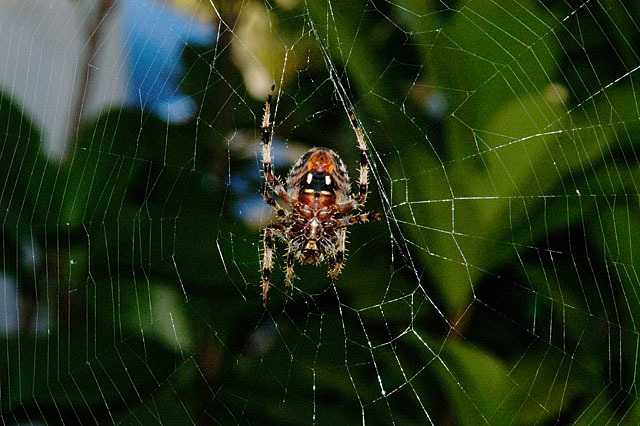 My Spider Webs page is here. Fall 2014 from Wimberley, TX, with the Nikon 105mm macro lens. More pictures from that Wimberley trip are here. 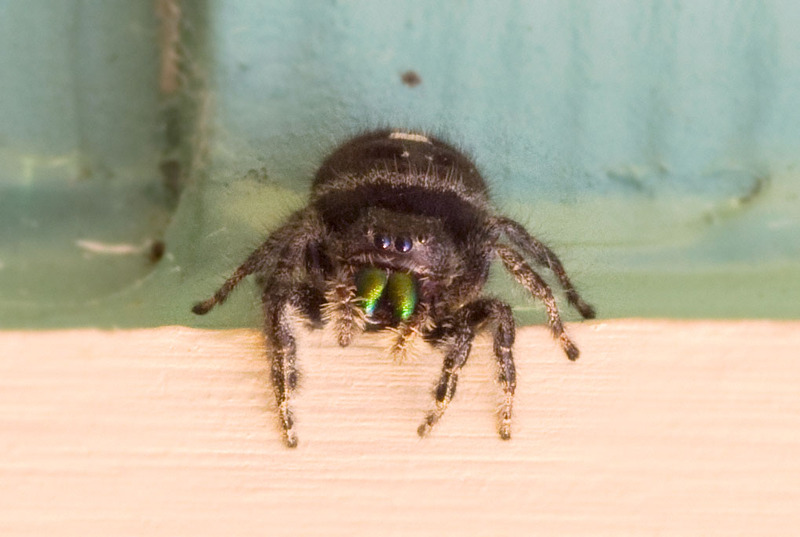 Check out the green "fangs" on this guy from Pleasant Lake, Michigan, June '09. He is lit up with the setting sun's soft red rays at the end of one of the longest days of the year. He really got busy about an hour after sunset; there were quite a few very small moths attracted to the light from the cottage for dinner. 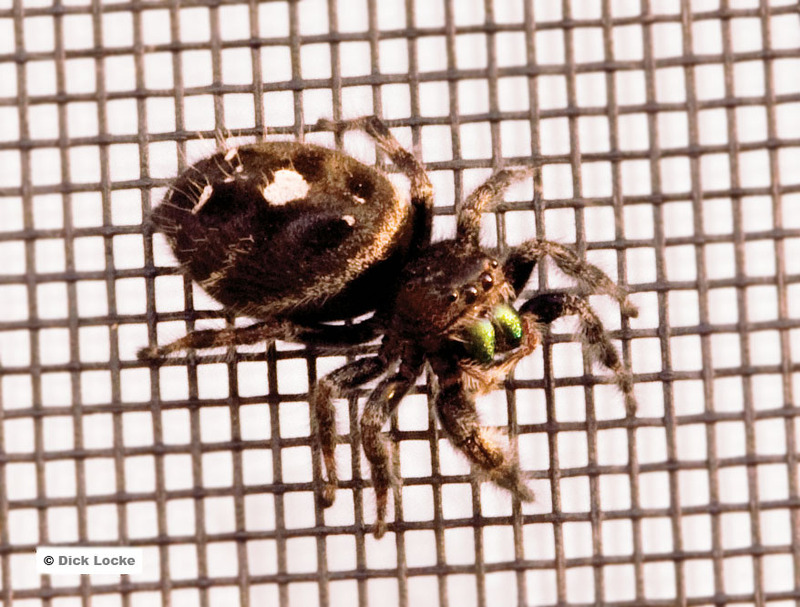 He's on a screened window, with the shade pulled on the inside of it. I had the tripod, Nikon D200, and Nikon Macro lens going on this guy. This is at f18, 1/20s, ISO 400. I'm glad he was holding still, it allowed me to get a good solid focus on the eyes and "fangs." Another Wolf Spider from the Starry Nights B&B. All this info paraphrased from Gil! 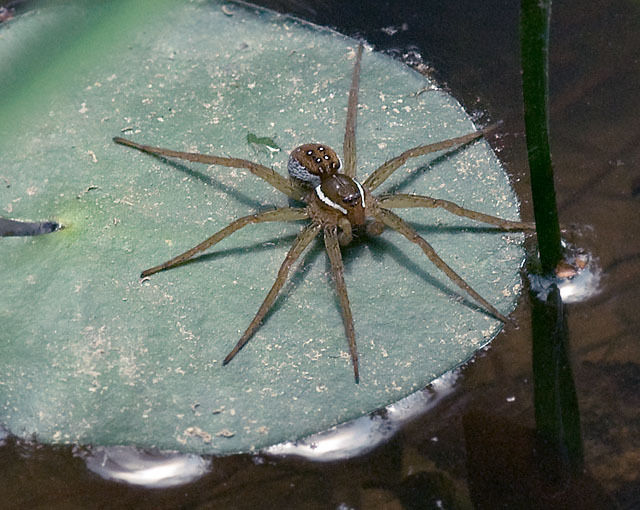 Very likely Dolomedes triton, the Six-spotted Fishing Spider which is found over the eastern two-thirds of the U.S. Family Pisauridae (the "nursery web spiders"), Genus Dolomedes, of which there are 15 quite similar species in the United States. 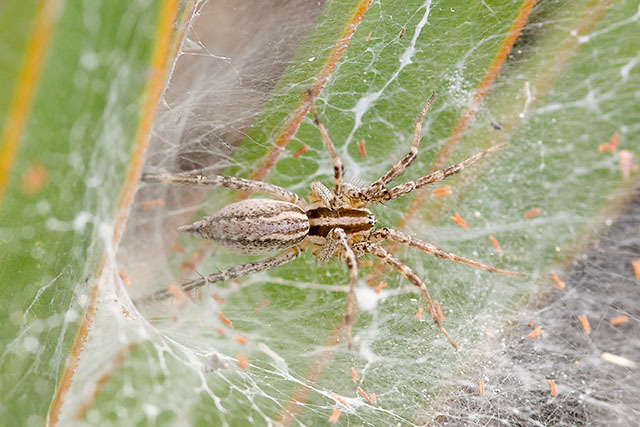 It matches the appearance of the six-spotted fishing spider in my "Spiders and Their Kin" book, also. Nikon 300mm F4 ED lens! Hand-held, 1/350s at f10. 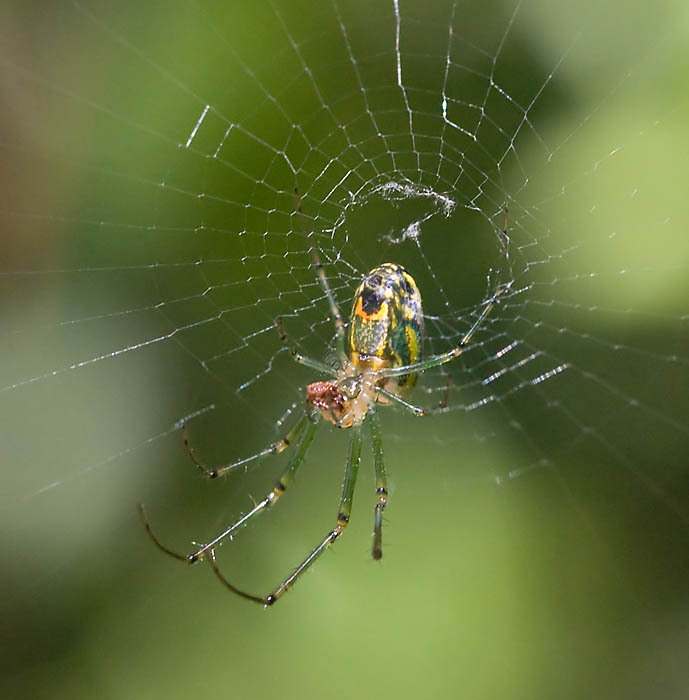 Jane and John B. say "The Top View is also an orb weaver but not an Argiope, ...likely in the genus Araneus or Neoscona." It looks a little like an Argiope, and it was within a few feet of the Big Argiope from last year. It's not doing the writing thing, though. This prickly devil was hanging around my telescope setup at the HAS site 9/2007. That's a towel underneath. Gil says family Oxyopidae. 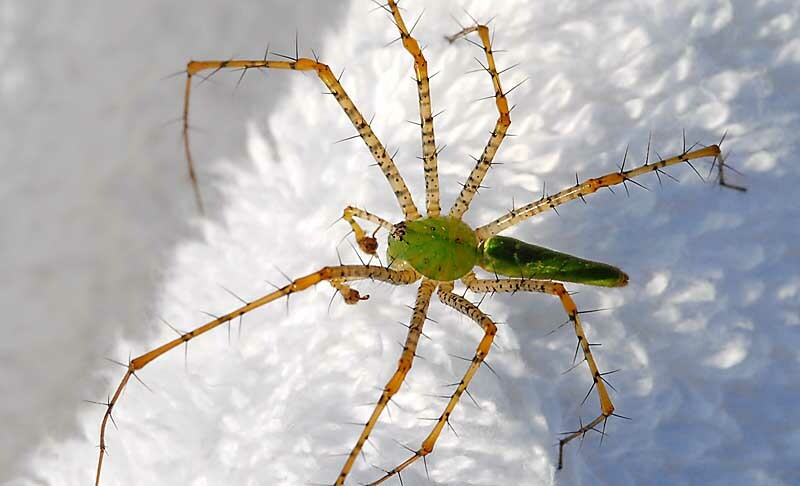 Jane and John B. say it's a "Green Lynx, in the genus Peucetia." 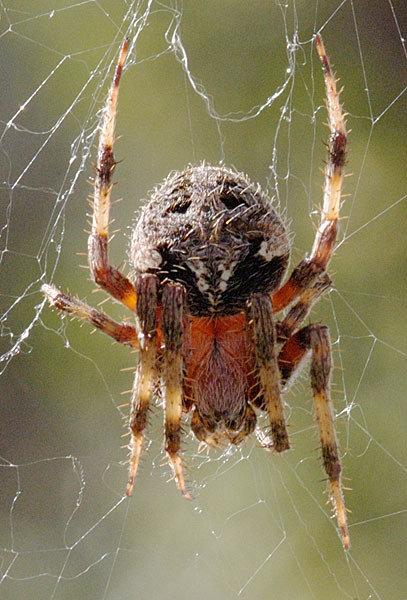 I have a close-up of the same flavor spider from the back yard here. 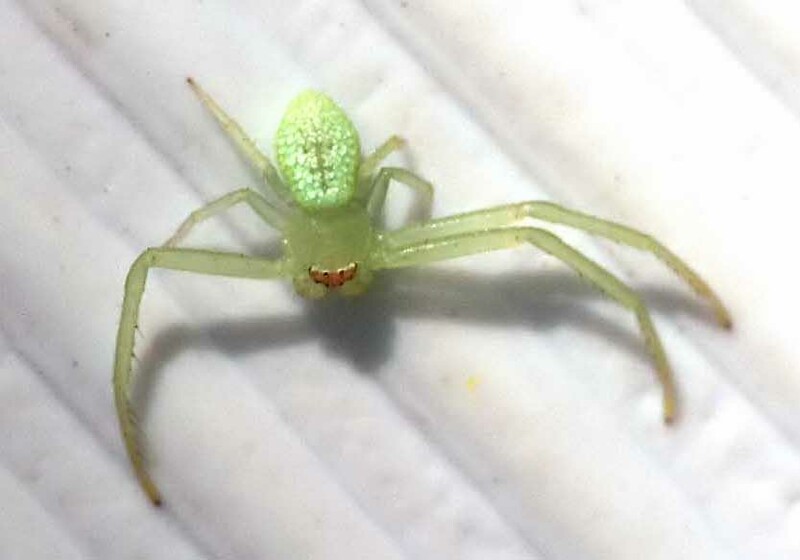 Jane and John B. say "... a crab spider, maybe Misumenops, but we are leaning toward Misumena." 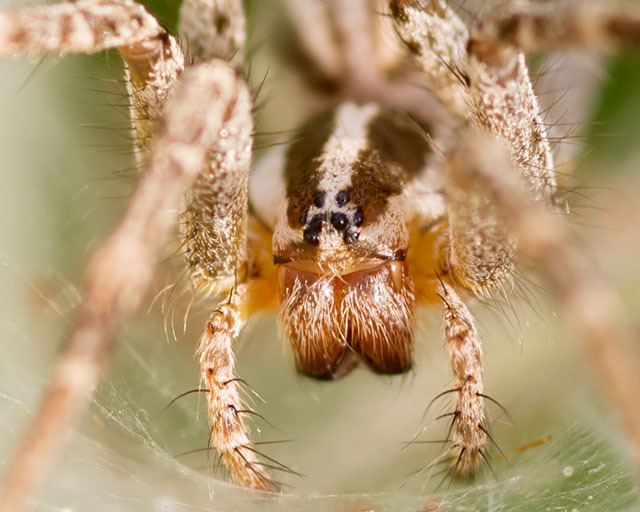 Notice the interesting design on the back of this spider, as well as the eyes. Llano, TX, May, 2006. He took a liking to the cooler top, which made him easier to photograph. 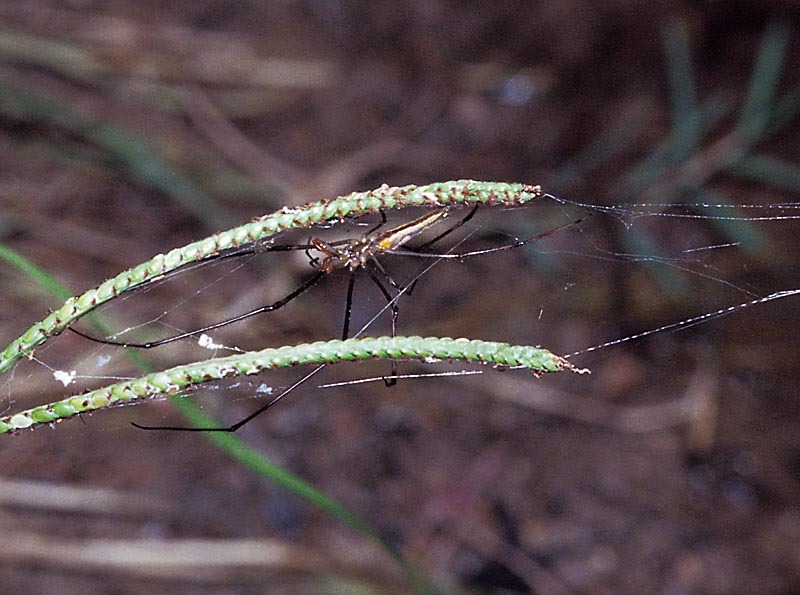 Jane and John B. say "...a long jawed orb weaver in the genus Tetragnatha." Close-up Orb Weaver Spiders. Pretty Prickly! 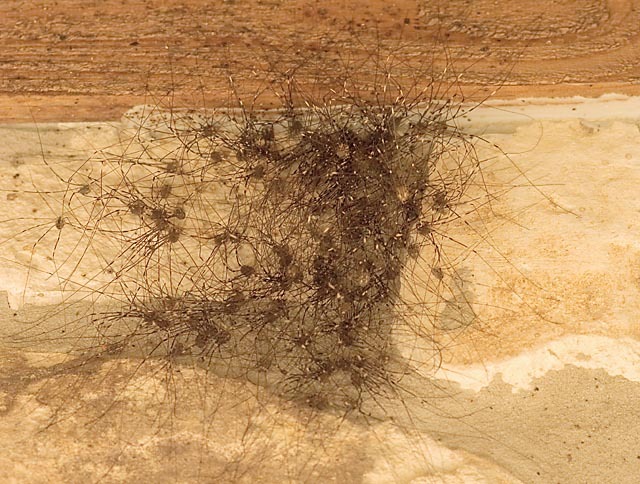 Harvestmen - a ton of 'em from Wimberly. What are they up to? Info on these guys is here. Jane and John B., "...The harvestmen are not spiders, but someone was just writing about these congregations and the chemicals apparently exchanged that put the harvestmen in some sort of torpor."